I was introduced to flame weeding years ago by Norbert Kungl, a well-known organic farmer in Nova Scotia. At first I thought it was outrageous! Now after seeing the reduction in weeds on my own farm, I am a big fan. Anything that can save time and effort in the market garden is worth considering. To understand this technique, you’ve really got to see it in action. Below I’ve embedded a video showing a flame weeder from Johnny’s Selected Seeds and how it works. This flame weeder is the original design where the flame comes out of a metal tube the size of my wrist. Flame weeding is most commonly used on hard-to-weed, direct seeded crops like carrots. You walk along the row, flaming the crop about a week after planting . TIMING IS EVERYTHING. You want to do the flaming just before the carrots emerge so all the pesky weeds are eliminated and the carrots can come up in peace. Ahhhh…. To see a 2 minute video of this process, go to http://www.johnnyseeds.com/p-6000-red-dragon-backpack-flame-weeder.aspx and go to the bottom of the page. David learned about a smart home-made flamer design that Andrew Giberson of Chestnut Acres Farm invented. Andrew shared the design with David during the break at a greenhouse conference. Never underestimate the power of the break at a conference! 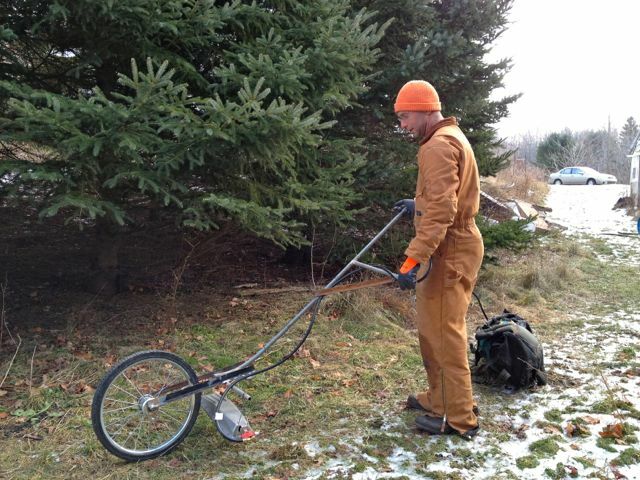 The flame weeder Andrew made uses a shop heater from Princes Auto called “Mr Heater”. They usually sell for $299 but Andrew (and then David) got one for $99 on clearance at the end of last winter. It has a ceramic element that creates a flame area about 15 by 4 inches, so more weeding can get done in one pass. It is mounted on a 20″ wheel and is held about an inch above the soil. Best of all, the ceramic element is very efficient, allowing the operator to do 8 hours of flame weeding on one tank of propane. The “Red Dragon” torch type uses up a tank in only one hour. Around here, one tank of propane costs roughly $30. At that price, each minute of flame weeding costs about 50 cents. With the new model, each minute of flame weeding costs about o.06 cents. Just think! Flame weeding on market gardens would use 8 times less propane. We hope to use our new flame weeder a lot this coming season. We’ll keep you posted! For more information, there is a very good article about flame weeding called Fire your Weeds in Growing for Market. This entry was posted in efficiency, growing vegetables and tagged DIY flame weeder, flame weeder, weeding carrots. Bookmark the permalink. 4 Responses to Flame Weeding! No, it did not work that well on thicker weeds like wild mustard. Its ok for light weeds like baby Lamb’s Quarters. I still want to try to make this idea work, but for now I’m using a wide flame weeder from http://www.flameweeders.com Its expensive ($600 USD) but worth it. How many BTUs is the heater? Now that it’s been a year I’m just curious to see how your flame weeder is doing. I built a root crop washer that is similar to yours using a variable speed treadmill motor and it turned out really well thank you for inspiration.